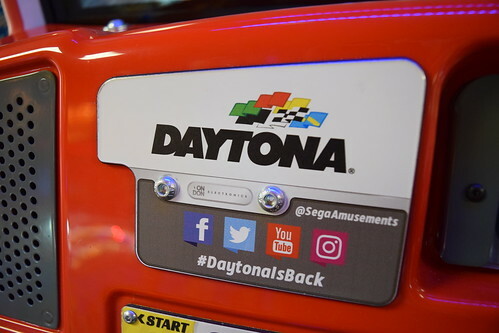 JAPAN, ARCADES & GAMING: Daytona Championship USA Hits The Arcades! 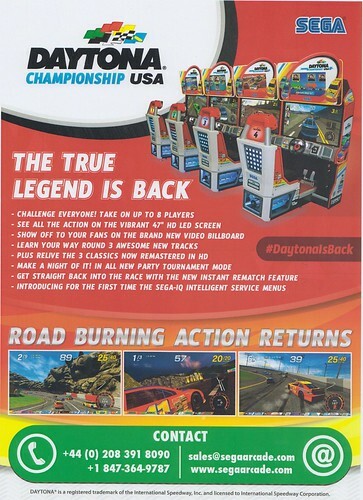 Daytona Championship USA Hits The Arcades! 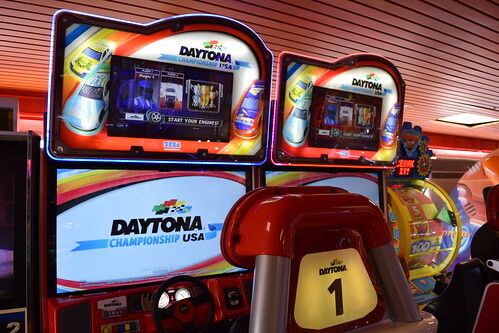 A local arcade in Great Yarmouth, The Golden Nugget now has a Daytona Championship USA twin set up. 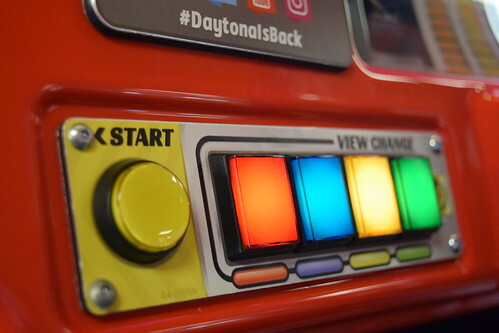 It’s great to see the new Daytona hitting the arcades and I have dropped plenty of gold coins into it to give it a thorough testing. Below are my thoughts on the game and some general observations. 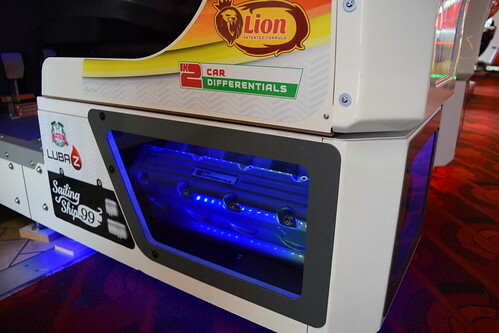 The cabinet is very striking, with its video billboard marquee, engine under the seat and cool colour changing LED lighting. The 47” HD LED screen provides a very immersive experience, although it does seem susceptible to glare and light reflections. A pic of the cab shortly after arrival. 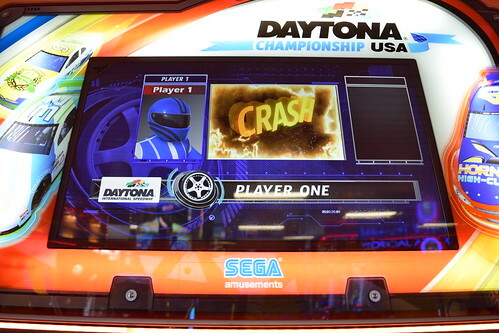 The cabinet utilises some parts from older Sega cabinets. 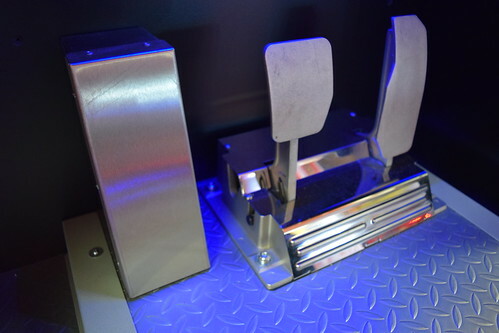 The gear shifter and foot pedal assembly are identical parts to those used on my OutRun2. Although the visuals don’t break new ground, the game does look good. With bright, vibrant visuals and blue skies, the game is unmistakably Sega. Three-Seven Speedway still features Sonic engraved into the side of the cliff face. The slot machine banners are now absent. The Jeffry statue on Seaside Street Galaxy has now been replaced with Akira. The music is good with some nice remixes of the original Takenobu Mitsuyoshi tunes. A ‘Live-TV’ inspired video board allows spectators to see what’s happening in the race. It also incorporates a live camera feed. The billboard is a nice feature and really makes the cab stand out. 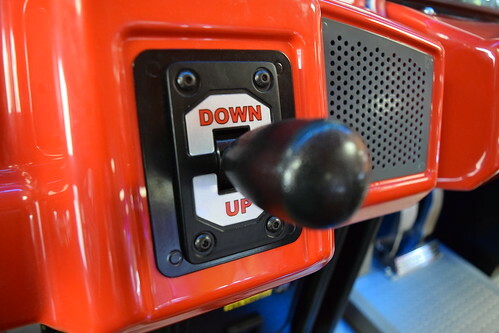 The cab still has the ‘up / down’ shifter as shown at EAG. 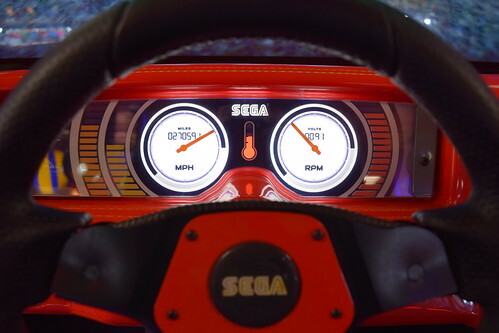 It looks as though Sega have made allowances in the design so that a four speed H-type shifter could be fitted. 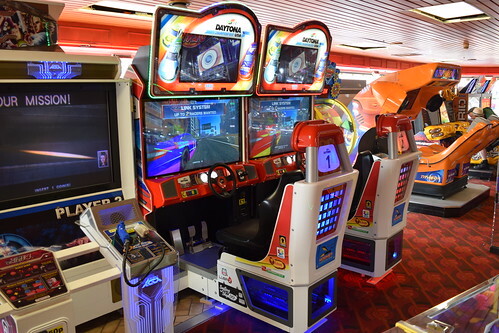 Despite the all new cab and graphics, the game feels instantly familiar. In addition to the three updated tracks from the original, there are three new ones. The game now features two beginner, two advanced and two expert tracks. Beginner comprises of eight laps, advanced six laps and expert one lap. The new beginner track is Daytona International Speedway. The track is very similar to Three-Seven Speedway and based on the newly renovated Daytona track. The new advanced track is Lakeside Castle Speedway. The track is a mirrored version Dinosaur Canyon and features a picturesque moated castle, a purple sky sunset and fire works. 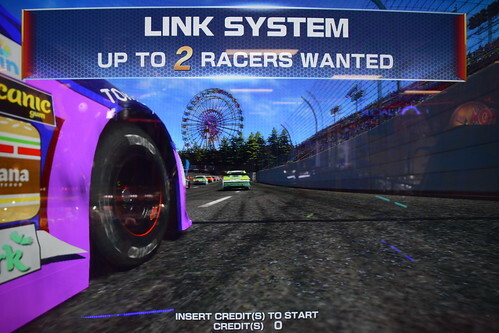 The new expert track is Metro City International Raceway and is a mirrored version of Seaside Street Galaxy. The cityscape track features a low-flying plane overhead and has a bit of a Ridge Racer vibe. 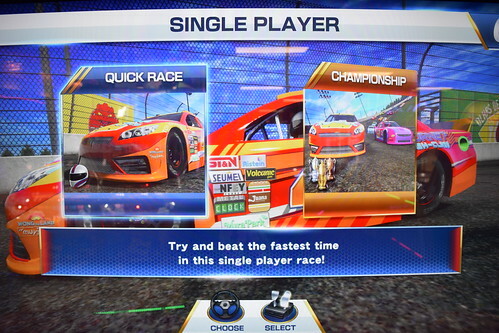 In single player there are two modes of play - Quick Race and Championship. 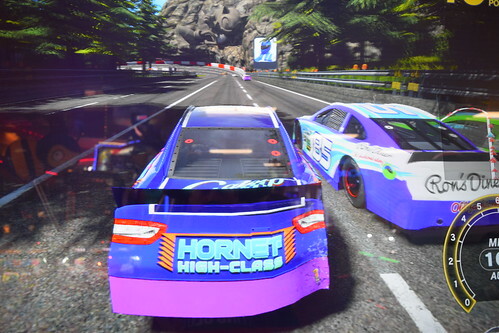 On Quick Race, the aim is to beat the fastest time of the chosen track. 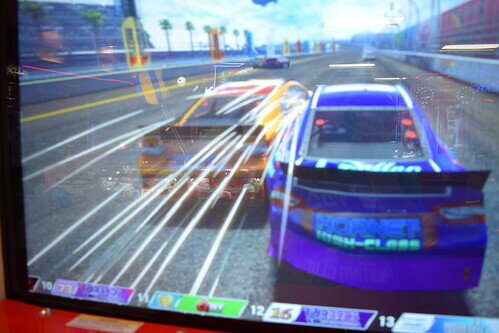 On Championship, the player must get in the top three in order to qualify for the next race. This is no mean feat and so far I haven’t managed to get beyond the first race. Daytona Championship USA is bound to divide opinion. The game is more of a reboot, and those hoping for a fully fledged sequel may be disappointed. The game has a strong nostalgia factor and is fun for casual and more serious gamers alike. 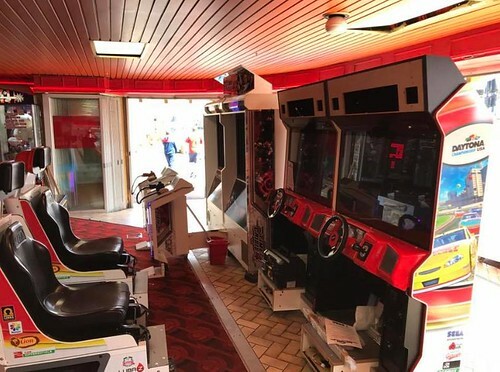 Personally I’m really enjoying it and happy to see Daytona back in the arcades.